As a special moe offer, you may have Eruruu wag her tail happily at you. Please mind your manners and refrain from grabbing the above-mentioned tail to confirm that it is genuine. Females in this village do not appreciate such indecency, and country women are stronger than you might think. 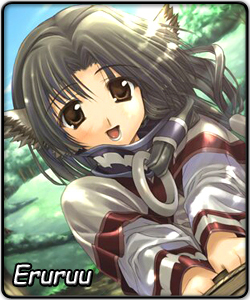 That said, you’re lucky to have stumbled upon Eruruu. She’s a kind soul and will surely find the time to show you around. As the Elder’s daughter, she knows the place better than anyone else. However, make sure not to step out of line. She likes order and discipline, and has means of enforcing them. See the huge tiger over there? Huh? Don’t run away, it won’t bite. And she can stare it down, easy. In case the tiger does bite, though, Eruruu will get you back to perfect shape in no time at all. She is a skilled and hard-working herbalist and doctor. In these troubled times, we need her more than ever... even if it pains the heart to see a girl this young facing war at our leader’s side. Surely, no tragedy may befall a girl so deserving of the favor of gods. But still, watch over her, alright? After all, under her brave front lies a fragile maiden’s heart.